A Mysterious Iraqi Sniper Pins Down Two U.S. 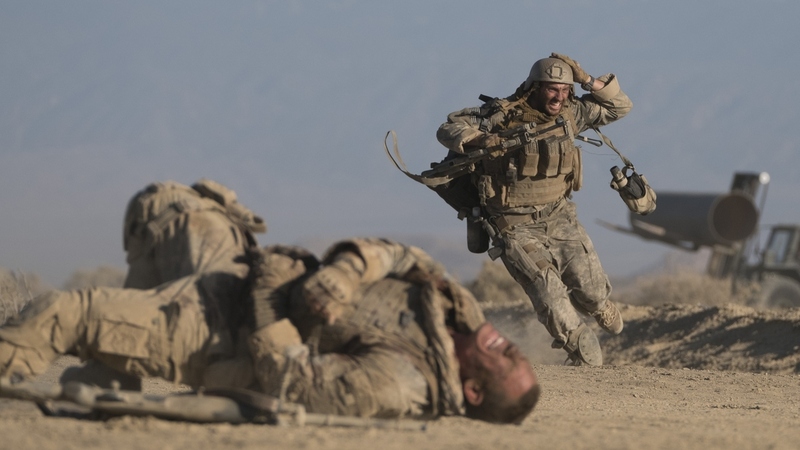 Soldiers In 'The Wall' John Cena and Aaron Taylor-Johnson star in Doug Liman's stripped-down, real-time thriller. Despite its script's many contrivances, critic Scott Tobias says Liman's direction is tense and unrelenting. Easy Targets: Matthews (John Cena) and Isaac (Aaron Taylor-Johnson) seek cover in The Wall. Through the premise of a U.S. spotter trapped by an Iraqi sniper, trying to improvise a third option beyond bleeding out and instant death, The Wall lands on a powerful metaphor for the Iraq War itself, particularly at that point in time. We know now that the end of the war was not, in fact, the end of the war— and that the end, a full decade later, still isn't in sight. But the unofficial skirmish that happens in the film strands an American soldier in a metaphorical no man's land between full engagement and pulling out completely. As politicians and defense officials are mired in their own strategic conundrum thousands of miles away, they're represented by a man stuck in one place, taking fire without end. Downshifting to a quick-and-dirty indie after a run of solid big-budget Hollywood productions like The Bourne Identity, Mr. and Mrs. Smith, and Edge of Tomorrow, Liman covers the terrain inch-by-inch, like an aesthetic infantryman. The film opens with Army Ranger staff sergeant Shane Matthews (John Cena) and his spotter, Allan "Ize" Issac (Aaron Taylor-Johnson) nearly a full day into scoping out a grisly scene. At the end of an oil pipeline extending in the desert, six construction workers and two security man are all dead, nearly all from gunshot wounds to the head. Matthews and Ize train their focus on an edifice of crumbling brick — the wall of the title — but can see no signs of movement. As Matthews leaves their post and moves closer to the scene, however, shots ring out and he falls to the ground. When Ize rushes in to help his partner, more shots hit him in the leg and send him hobbling behind the wall, where he's a sitting duck until more help can come along. In an effort to call for assistance from his broken radio, Ize lands on a local frequency, where the Iraqi sniper (voiced by Laith Nakli) taunts and manipulates him from an unknown location. Known as Juba, "the angel of death," Ize's adversary is rumored to have posted 75 U.S. casualties and he's got the upper hand again here. Though the script, by Dwain Worrell, made the Black List of Hollywood best unproduced screenplays, The Wall struggles to wrest itself from a host of contrivances, like the parceling-out of a backstory involving the half-busted sight Ize insists on using. The interplay between Ize and Juba covers the most pages, but even there, the talk that's pertinent to their standoff is much stronger than their rumination on the Iraq War in general. We already know they're two snipers serving on opposite ends of a rudderless conflict without Juba explicitly noting that they're "very much alike." As an exercise in film direction, on the other hand, The Wall is tense and dynamic, tremendously active within the narrow parameters of the action. Liman defines the area clearly and methodically, mimicking the limited perspective of a spotter who's trying to ascertain where the shots are being fired. And The Wall is admirably uncompromising in refusing to grant Ize more leverage than he has in a spot where Juba holds all the power. Not only can Ize not MacGyver his way out of trouble, there's every indication that Juba is the smarter and more capable of the two men, like some threat from the ether. "The angel of death" is punishing Ize for his country's sins.